Shippers are directly responsible for the correct and legal transport of dangerous or hazardous materials by ground, air, or sea. Anyone involved with shipping hazardous substances such as chemicals, radioactive materials, or biological materials (including infectious agents, genetically modified micro-organisms, or diagnostic specimens) is required to receive special training. Anyone who offers advice for transport, transports, or handles hazardous substances for transport must be trained. (Code of Federal Regulations (CFR) 49, Part 172). Warning: Failure to comply with federal and international transportation regulations when shipping hazardous materials can result in civil penalties of $32,500 per occurrence and in criminal penalties including five years imprisonment. All outgoing shipments of infectious substances, genetically modified micro-organisms, patient specimens, and other hazardous materials must be processed by the Environmental Health and Safety (EH&S) Department. 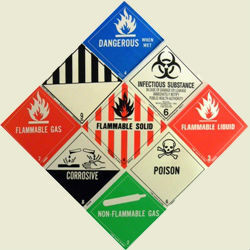 If you plan to ship hazardous materials, please contact EH&S in advance and carefully follow the guidelines below. Exception: If you plan to ship radioactive materials, follow the instructions on How to Transfer Radioactive Materials. Bubbler cylinders: To return bubblers from Rohm and Haas or Dow Chemical, email itcsr@dow.com with the serial number and product/chemical used with the bubbler. In a timely manner, Dow Chemical should respond with a return application that will include instructions on returning the item. Using the original packaging for shipping is recommended. Use this form to request shipping assistance from EH&S. Form must be completed for all hazardous materials and biological substances, then submitted to ehs@ucsc.edu. Form review and shipment preparation may take from several days to weeks, depending on the complexity of the shipment and the desired destination. Shipping Documentation Record - Use this form to document the classification of unregulated biological materials. Bring this form with your shipment to Mail Services. UCSC typically uses FedEx for domestic and international hazardous material shipments. When FedEx does not service a specific location or type of shipment, other carriers may be used. Notice: The information presented on this page and elsewhere on this site is a summary of UCSC policies and national and international regulations. In case of a conflict in interpretation, the actual policies and regulations apply.